The bakery business, in the modern business environment of today, is a thriving business. Each year, as the clamor for sweeter cookies, chocolate cakes, pies, tarts et al reaches it's crescendo, the retailers and manufacturers too feel the need for innovation and updates of their product lines. In the US for instance, creativity in Wedding cakes has emerged as a fashion statement, with even the middle class consumers willing to pay a premium for an event. In fact, experts believe that the bakery industry defies the fundamental law of demand, wherein, premium pricing for exquisite items results in higher volumes! Current consumption of Bread and Bakery products are pegged at approximately $ 69 million. The average per capita consumption is 42.5 kg / year. The per person consumption is $ 207 /year. The average price per unit is expected to be $ 4.88 in 2018. The US bakery products includes more than 2,800 commercial bakeries with combined annual revenue of about $ 30 billion, along with 6,700 retail bakeries with annual revenue of about $3 billion. In the US, the commercial side of the industry is concentrated ie, the 50 largest companies generate 75% of the revenue. The retail side again, is highly fragmented ie, the 50 largest companies generate 20% of the revenue. With the decreasing cost of primary ingredients, the prices of most bakery items expected to diminish, making the cakes, cookies, tarts, pies cheaper for the consumers. On the part of manufacturers as well, this decrease in the cost of production will enhance their profitability, since they can adjust their cost-revenue parameters better. Many bakeries may trim down their product lines and focus on consumer preferences and seasonal varieties. Finding a balance between offering a variety to more consumers and offering truly profitable products will call for a detail analysis of the cost-revenue parameters. Growth of demand is determined by several factors germane to consumer preferences, which can range from more chocolaty, more sweety, more darker brownies to gluten-free and salty treats. Increase in disposable income of consumers, fresh innovations in cakes, cookies, pies by the retailers, or even the influx of tourists at certain times, all add up towards this growth in demand. Retail bakeries in smaller towns will be driven more by branding and tie-ups. Teaming up with local theaters, sports and musical events will drive demand. The bakeries can offer more specialty items with more efficient logistics support. In larger cities, profitability will be determined by the efficiency of operations. Larger companies , due to their larger scales, have the advantage in procurement, production and distribution. Retail companies, who manufacture their own bakery items such as cakes, muffins and croissants will be able to sell more to the supermarkets, convenience stores and food-service bars and restaurants in their locality. Point-Of-Sale advertising through the digital signage menu board will grow exponentially. Digital signage will provide faster up-sells of items at real-times. Thus, better margins for the bakery. Digital Menu Board designs, coupled with the visual appeal of the signage will enhance footfalls. Digital signage will enable customers to see the menu more clearly and take quick decisions for order. The 'Cloud based Program' of digital software will enable the bakery owner to coordinate operations of his restaurant better. Retail bakeries will integrate and collaborate with the various consumer touch points more effectively. This particularly relates to mobile and online social media integrations. Digital signage will enable retail shops to focus more on positioning and branding their shops and product lines ie, in terms of locations, testimonials of satisfied customers, endorsements by local celebrities/politicians. 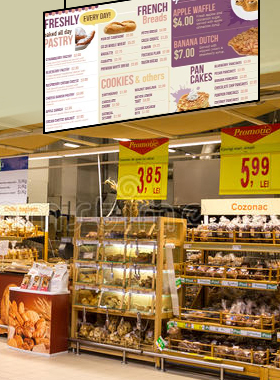 Digital signage will facilitate better product differentiation with respect to competitors. Cakes with more chocolate or cookies and donuts made with a superior quality of wheat / flour will certainly make an impact.